Canada's leading independent think tank has announced they will be hosting a panel of public policy and political experts to discuss the first 3/4 of the Federal Liberal Government and look at what to expect in Election 2019. You can register for "the forum on-line. Policy Options Magazine has been providing a diverse forum for decision makers and public policy for a generation. The magazine, articles and podcasts can be found on the Policy Options website. As a student, journalist and later, political hack, it has always been my go to for articles and debates on public policy. Founded in 1972, the IRRP is an independent, national, nonprofit organization. Among other things they seek to improve public policy in Canada by generating research, providing insight and sparking debate that will contribute to the public policy decision-making process and strengthen the quality of the public policy decisions made by Canadian governments, citizens, institutions and organizations. IRPP's independence is assured by an endowment fund established in the early 1970s. This promises to be an independent, well informed session. Canadian Mental Health Week 2018 has come and gone again. As the stigma of mental health challenges is addressed through education and some improvements in services, there really is hope for many who suffer needlessly. However, in my opinion there is still quite a lot of work to be done to address the needs of students and males. I was left wondering about the different approaches to mental health for genders and why men continue to be more likely than women to kill themselves? As a school board trustee, school council member and former President of the Federation of School councils, I have long advocated for enhanced mental health services for a student population whose needs are growing in numbers and complexity. Existing resources are stretched to the point that caseloads prevent existing professionals from providing meaningful assistance. More resources are needed. Currently, the formula provides for one counselor for every 500 students when organizations like the NLTA, NLFSC and the NLCPA have been calling for a ratio of 1:250 for some time now. We obviously need more school-based mental health professionals to ensure that needs are met in timely fashion. The result would be effective interventions. The provincial governments blueprint Towards Recovery: The Mental Health and Addictions Action Plan for Newfoundland and Labrador is moving in the right direction but at a tortoise pace. One of the most significant gaps is the provision of specialized mental health care services is for treating men. Women with depression are more likely to attempt suicide but men are more likely to die by suicide. Women are also more likely to see their GP and seek treatment. Men are simply not seeking treatment. It remains culturally hard in a society where suicide is considered by many to be morally and mentally weak. Men are more likely to be arrested because they have behaved badly than go see a doctor and talk about the problems they face. In fact, men are often more intent on dying, they are more prone to "spur-of-the-moment" suicidal behavior and they use more effective means of killing themselves. Juxtapose this against the fact that men have been culturally predisposed to be the "stronger gender" - we are not supposed to talk about issues the impact us emotionally or negatively. When is the last time you heard someone say "women up?" or to "grow a pair". Is it any surprise that male suicide rates are so high? Add to this that most men who kill themselves are not diagnosed with a condition. It is obvious that there are still huge gaps in preventing male suicides. Despite acknowledging all of this we do not take a gendered approach which would greatly improve outcomes for young males and middle aged men. Why don't we have Men's Centers where men can go to talk about their challenges without feeling like less of a man for doing so? Why are these resources unavailable to men when they need them? Its time for a plan that talks about gender - and that minority composed of men. Memorial University Political Science Profesor Amanda Bittner's issued a cutting criticism of Premier Dwight Ball in an opinion piece for CBC, this past weekend. I expect that many of my readers have read and discussed this article. There is a long tradition of abuse, intimidation and internal rivalries in party politics. Politics is often referred to as war by other means. dynamics of our zero-sum, to-the victors-goes-the-spoils and nepotistic party system. While party's speak of accountability, transparency, and democratic reform, there has been very little done to introduce democracy to the caucus system. Government MHAs are expected to be seen - not heard. Their votes pre-determined with very little input from a legislature that needs a broader committee system. Even speaking out in the privacy of caucus can be a ticket to a career in the backbenches. While the gender issues have taken the spotlight, I think in the case of Dale Kirby, it would be fair to say he was an equal opportunity bully. While I have declined a number of interview requests because I did not wish to "pile-on" but after reading Professor Bittner's closing comments, I felt obligated to point out that there is a pattern of berating and intimidating individuals and organizations that disagreed with his position - or dared challenge him. I was a little disillusioned with his transformation from an advocate for education issues to spouting the same lines as his Progressive Conservative predecessors. The financial crisis left by the freewheeling big spending tories left the new administration very little room to navigate; a number of campaign promises were abandoned and a tax on literacy was introduced. My obligation to students, parents and school councils was to articulate their concerns. I take my integrity and commitment to organizations seriously. On June 19th, 2016, the Newfoundland and Labrador Federation of School Councils met with Minister Kirby to discuss issues of concern in the wake of that year's budget. The meeting took a bitter turn when Kirby called me out for comments I had made the previous day on VOCM Open Line related to the continued delays in construction of East Point Elementary. He took the opportunity to scold me and threaten to cut the funding of the provincial organization if I were to continue advocating publicly on the issue. In the face of this indimidation of a volunteer organization, I walked out of the meeting and immediately called the Premier's office to discuss this incident of bullying and never received a return call. Later in the Fall, after the same Minister publicly challenged the credibility of the NLTA President. The accusation was false. During a subsequent conversation with Pete Soucy on VOCM Backtalk, I called the Minister a bully which led to a strong-handed approach to have me removed as President. In the meantime, some disparaging rumors and a whisper campaign began that caused me a great deal of anxiety and concern about my professional reputation. I became the target of a scorched earth campaign. Still related to education, the Minister wrote a blistering letter to the Newfoundland and Labrador English School District reminding trustees of their duty to keep our mouths shut and not to disagree with the provincial policy. He was not impressed with Trustee Jennifer Aspell who had publicly expressed her concerns about problems and delays with the extension to the Mobile Central High School. Keeping in mind the area had been approved for a new school but the decision was reversed in the 2016 budget. The governing board questioned the decision but government refused to bend. The board also requested an apology for Aspell but it never came. There are many other examples of this particular MHA bullying individuals of differing genders, organizations and MHAs in an effort to stifle discussion and perceived dissent. Amongst them is his arrogant approach towards the members of the NDP Caucus in the House of Assembly where he regularly derided serious questions with insults and innuendo, lobbying fellow MHA's to not attend fundraisers for Government MHA's and of course the infamous e-mail seeking out the "leak" following the oppositions revelations of harassment concerns in the Liberal Caucus. To allow him back into the cabinet, or the caucus would only reinforce the idea that abusive politics is a permissible modus of operation in our democratic institutions. I look forward to a comprehensive reform of the caucus system, the enhancement of individual MHA's independence, a clear harassment policy that allows the victim and the accused to find a fair, independent resolution that educates and changes unacceptable individual and group behaviors. 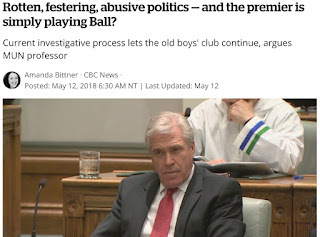 Premier Ball has an opportunity to transform democracy to make the House of Assembly a less intimidating environment for all individuals who prefer not to be treated like mushrooms. Less anyone thinks that this behavior is limited to this Liberal Government. Just recently, Federal Green Party Leader Elizebeth May was the focus of an independent review into claims of workplace bullying. Last week, The Green Party of Canada released a report that found that the allegations of three former party employees "do not constitute workplace harassment." She was accused of various forms of verbal and emotional abuse, including yelling at the staffers, putting them down in front of colleagues, and in one instance, slamming a door over an office paint job. Disrespectful behavior for sure but it did not meet the legal standard of workplace harassment. I wonder how Dr. Bittner feels about her colleague returning to teach at the university in light of his established pattern of intimidation, abuse and divisiveness? And here is the link to the article.